This study examines a method for displaying complex data clusters using a branching framework which interconnects multitude series of spherical shells. This is one of a series of studies for the creation of a visual metaphor for representing complex data clusters in spherical space. The following POV-Ray scene description language source code generates an arrangement of nested spherical shells centered at the nodes of a branching framework. The intent is to provide a branching framework of spherical shells for use as a spherical metaphor or Spheriphor. In this way, the branching framework may be used as a visual metaphor for representing complex data clusters in spherical space. The methodology generates a branching framework that connects a sequence of progressively smaller spherical shells. In this study there are three levels of branches. Each branch terminates at a node where the next level of branches emerges. A series of nested spherical shells is centered at each node. The spherical shells create a spherical grid for comparing the lengths of the branches and thus provide the basis for a system of metrics. While this study displays the branching framework in a flat plane, one can imagine the framework wrapped around a dome projection screen. The dome would provide a 360 degree, immersive experience of the data set. Navigation into any given branching point (node) would provide a zoom factor or a deep dive into the data. For example, the user selects a node via a user interface, the camera point of view then zooms to the center of the selected series of spherical shells. This new camera view point becomes the center point of the dome projection system. In this way many levels of data could be navigated and the fine details of data sets revealed. The Fibonacci Series is used as a sample data set for this study. The reader can see the spiral form that emerges. This is the same spiral form which is found in the spiral arm of a galaxy, the cross section of a nautilus shell or the center of a sunflower. Persistence of Vision Raytracer (POV-Ray) is used to parametrically generate images of a spherical metaphor for multi-dimensional data visualization on a digital dome projection system. 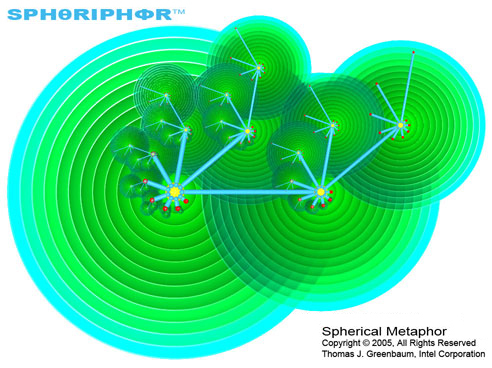 This spherical metaphor, or to coin a term “Spheriphor,” takes advantage of the opportunity to visualize high-density, multi-dimensional data using spherical coordinate systems. Virtual Globes may also use the Spheriphor to display non-GIS data. The POV-Ray Spheriphor generator uses one file, the Spheriphor_Study04.pov scene description file. Copyright (c) 2005 by Thomas J. Greenbaum. Some Rights Reserved.